The ability of bacteria to form organic compounds by metabolizing certain carbohydrates and related compounds is a widely used method for the identification of microorganisms. Different fermentation media are used to differentiate organisms based on their ability to ferment carbohydrates incorporated into the basal medium. 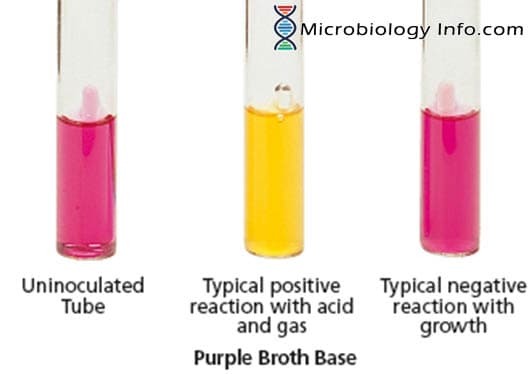 Purple Broth is used for studying carbohydrate fermentation reactions, particularly in the identification of gram-negative enteric bacteria with desired carbohydrates added. Purple media were originally formulated by Vera. This medium is recommended by FDA for fermentation studies of sugars. The principle of carbohydrate fermentation states that the action of organism on a carbohydrate substrate results in acidification of the medium, detected by a pH indicator dye. Carbohydrate fermentation is the process microorganisms use to produce energy. Most microorganisms convert glucose to pyruvate during glycolysis; however, some organisms use alternate pathways. A fermentation medium consists of a basal medium containing a single carbohydrate (glucose, lactose, sucrose, mannitol etc.) for fermentation. However, the medium also contains various pH indicators. In addition to a pH indicator to detect the production of acid from fermentation, a Durham tube is placed in each tube to capture gas produced by metabolism. The carbohydrate fermentation patterns shown by different organisms are useful in differentiating among bacterial groups or species. The purple broth consists of peptone with the pH indicator bromcresol purple. Specific carbohydrates are added in a concentration of 0.5-1%. This concentration is recommended to ensure against depletion of the carbohydrate and reversal of the fermentation reaction. When the media are inoculated with an organism that is able to ferment the carbohydrate present, acid or acid and gas are produced. A Durham tube is provided in tubed broth media to collect the gas produced during fermentation. The indicator in the media changes from purple to yellow when the amount of acid produced by carbohydrate fermentation is greater than the alkaline end products from peptone utilization. If the carbohydrate is not fermented, the color will remain unchanged or become more alkaline (darker purple) due to degradation of the amino acids in the medium. Allow medium to warm to room temperature prior to inoculation. Inoculate the Purple Broth (with carbohydrate of choice) with isolated colonies from an 18-24 hour pure culture of the organism. Inoculate a control tube of Purple Broth Base in parallel with the carbohydrate based media. Incubate inoculated media aerobically at 35-37ºC. for 3-5 days. Note: Increased incubation up to 30 days may be necessary for some microorganisms. Observe daily for development of a yellow color in the medium. Positive: The development of a yellow color in the medium is indicative of a positive carbohydrate fermentation reaction. Negative: Lack of yellow color development is indicative of a negative carbohydrate fermentation reaction. Gas formation is indicated by the appearance of gas bubbles in the Durham tube. They are used primarily for the differentiation and presumptive identification of gram-negative enteric bacilli based on patterns of carbohydrate fermentation. It is recommended that biochemical, immunological, molecular, or mass spectrometry testing be performed on colonies from pure culture for complete identification. It may be necessary to invert the tube prior to inoculation if bubbles are trapped in the durham tube. Trapped bubbles that are not released may lead to false-positive results.